On Friday night, the members of Temple Kol Tikvah in Davidson opened their arms and hearts to welcome visitors to their Shabbat Shalom service. 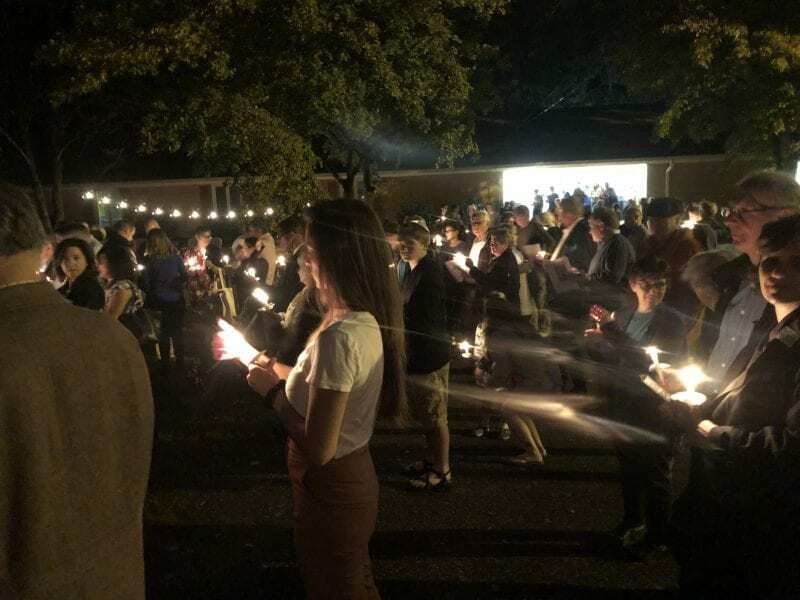 Rabbi Michael Shields issued a generous invitation to the community to join in the service, and the exact place so many of us wanted to be on Friday night was Temple Kol Tikvah. 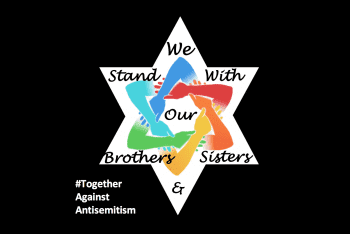 We were weighed down with grief over the murders that occurred in Pittsburgh at the Tree of Life Synagogue, and all we had to offer was our presence and our love for our friends and neighbors at the temple. The room was filled to overflowing and people stood in the hallways and even outside. We laughed and cried together, reading and repeating beautiful words, led by Rabbi Michael. We sang and we prayed, and we felt love in that place. who quickens those who have forgotten how to live. our own powers in touch with the power of the world. Rabbi Michael spoke words of grief and words of encouragement. He told us that shiva, the time of mourning, was over, that now was the time to face forward and not turn away from the work to heal our hurting world. He introduced two young people who would be rejoicing in their bar and bat mitzvahs, the coming-of-age ritual for boys and girls, later this weekend. What more optimistic and hopeful thing could there be than to lift up two young people and, with profound gratitude, celebrate their lives. This focused us on the future, on helping to create a future that is happy and productive, rather than one that is sad and broken. It was a joy to see their shining faces in front of us, so full of promise, pledging accountability for their actions. It helped me feel hope for the first time in days. Then the members of Temple Kol Tikvah handed out candles and made sure that all were lit against the darkness. We stood in a huge and friendly circle and we sang songs that Rabbi taught us. We talked and embraced and cried some more. We became the beloved community. We are the beloved community: young and old; black, white, Latino, and Asian; those of all beliefs. All are beloved. And it will require all of us to take up the work of solace and change in a hurting world. Thank you, Rabbi Michael and members of Temple Kol Tikvah for your kind welcome to us. You gave us hope. Your warmth comforted us. Your love surrounded us. We will walk in the garden of a purposeful life and we will flower toward the sun. We will remember, and we will let the stars that light up the darkest night guide us. Marguerite (Margo) Williams is a novelist ("Madame President"), editor, and business owner of A Way With Words. She has lived in Davidson since 1977. Visit her at her website.